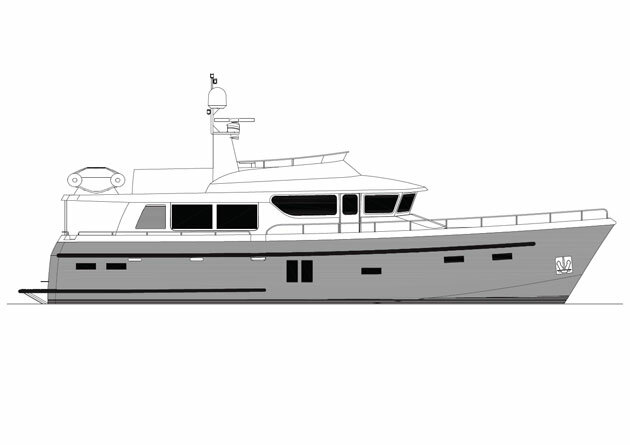 Motorboat & Yachting: A new Hardy 62 with a whole host of changes, including an updated interior, will hit the water in 2016. We spent a lot of time on board Hardy 62 hull number one. In fact, we took it from Ocean Village in Southampton over 200 miles to its home in Fox’s Marina in Ipswich. We stayed on board for a night, took it in and out of marinas, charged along at 25 knots and dawdled in single figures. We got under the skin of the 62 and came to the conclusion that there was a fantastic boat begging to get out. The first boat, the Southampton show boat, was designed for a Russian owner who as well as specifying a gun cabinet in the master cabin settled for a solid if rather drab and uninspiring interior and seemed to want a boat that felt more rugged than refined. Hull number two, though, which is currently in mould at the factory in Norfolk is going to hit the water with a whole host of improvements, that will hopefully transform the 62 from a good boat to a great one and one that can comfortably go head to head with the best. So, what’s changed? Firstly the traditional interior is out in place of what Hardy says is a far more modern “but not glitzy” effort. This is good news and if the rendering below is anything to go by the new interior should be really rather special. There’s a vibrant mix of grey woods and more traditional walnut, stylish fabric wall panels, improved lighting and, thankfully, Hardy has finally succumbed to using large hull windows. Okay, they aren’t quite at Princess’s level but they’re a start and, crucially, the interior looks to be more fitting of a boat with a seven figure price tag. Another area of the original boat that needed some attention was the flybridge, which was sparse and lacking in creature comforts. No such problems on the new one, which has a radar arch in place of the mast with a wet-bar at the bottom containing a fridge and electric BBQ grill. Seating options are far better, too, and Hardy has sensibly made use of the enormous aft section of the flybridge by fitting a U-shaped dining area with a hi-lo table so you can transform it into a sunpad. Of course there is still space for a decent RIB and the crane to lift it with. There have been tweaks to the helm on the top deck, too, with increased wind protection and more adjustment on the seats and steering wheel. This particular build lacks the very useful internal staircase that we found so useful on our trip from Southampton to Ipswich but Hardy would include one if you wanted it.